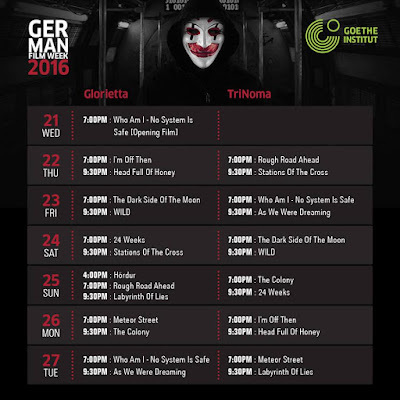 Goethe-Institut Philippinen serves up an impressive feast of films for the 1st edition of the GERMAN FILM WEEK, encouraging audiences to cozy up to contemporary German cinema. The GERMAN FILM WEEK opens with a star-studded thriller that is relevant and groundbreaking. The film, WHO AM I – No System Is Safe (WHO AM I – Kein System ist sicher), is the story of a gifted computer hacker and his group who gain popularity in the web community with their daring guerilla actions. Directed by Baranbo Odar, this German techno-thriller ranked no. 1 in the German cinema charts immediately after its release. Film enthusiasts will be given the chance to delve into the rich variety of German cinema with themes on family, love, and loyalty, to grittier issues of identity, history, and surreal realizations. These contemporary releases include The Colony (Colonia Dignidad), a political thriller based on the true story of a notorious Chilean sect founded by German emigrants in the 70’s. The Colony stars famous German actor Daniel Brühl and British actress Emma Watson. A warm-hearted film about the topic of Alzheimer, Head Full Of Honey (Honig im Kopf), is a sure crowd pleaser as it tackles family values, and is directed by award-winning actor-director, Til Schweiger. Other films included in this year’s lineup include a brave and emotionally-charged drama, 24 Weeks; a sensitive story about friendship, Hördur, and a radical and sensual film about a woman and a wolf, entitled Wild, among others. 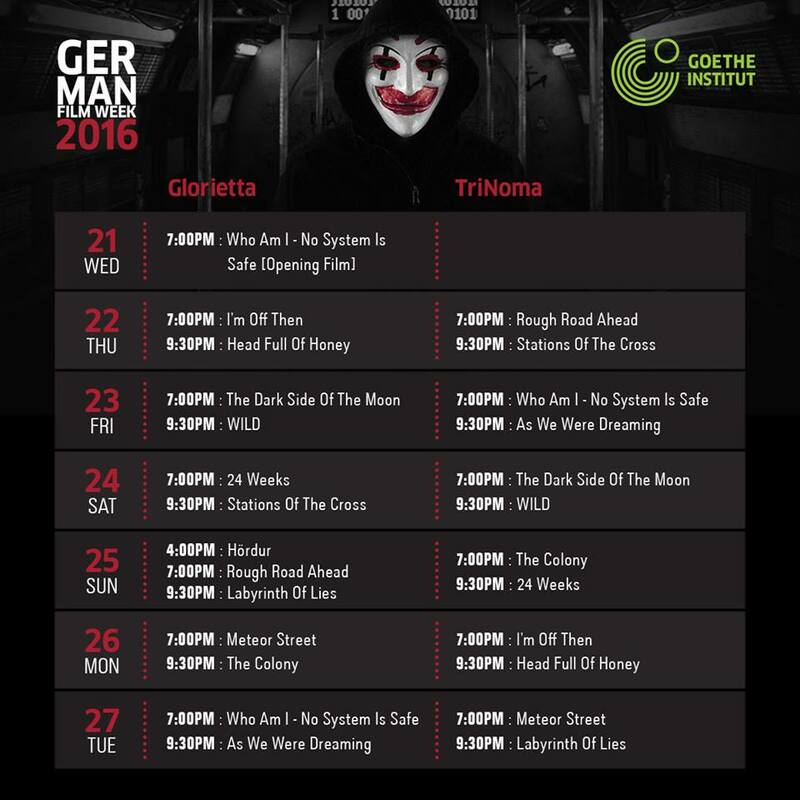 The opening night and gala screening of the 1st GERMAN FILM WEEK is strictly by invitation, and starts at 7pm at the Glorietta cinema. Regular screenings follow from September 22 through the 27th, at both Glorietta and Trinoma cinemas, with tickets priced at Php 100. Tickets are available via SureSeats.com or at the mall cinema counters starting September 12. A VOTE AND WIN contest will be launched in line with the festival wherein audiences can vote for their favorite film, for a chance to win special prizes. 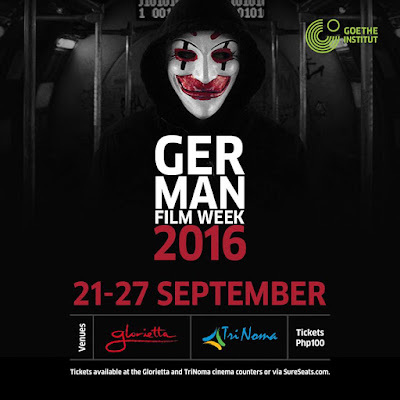 The German Film Week is made possible through the partnership with Ayala Cinemas and the support of the Film Development Council of the Philippines. For more information, visit Goethe.de/Manila, or contact program@manila.goethe.org.